PTS welcomes students to The University of Texas at Austin. Several options are available to meet student parking needs. 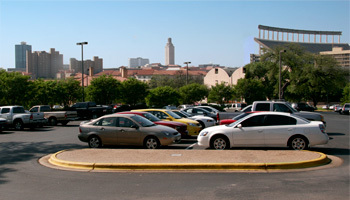 The campus is pedestrian friendly, with shuttle bus service throughout the campus and Austin. Understanding the student options for parking and transportation will make campus access easier, and following the parking regulations will promote student safety. The links will provide parking and transportation options including instructions on how to obtain parking permits for surface lots and garages, shuttle bus information, as well as alternative transportation options. To return your permit, please bring it to the cashier's office in one of our 7 staffed garages. The University of Texas at Austin strongly supports efforts to reduce congestion and curb vehicle pollution in the Austin area. The University has established an active Alternative Transportation Program, entitled Green on the Go, that seeks to reduce the use of single occupancy vehicles by staff, faculty, students, and visitors.